This gorgeous hotel offers 213 guestrooms, 31 suites, and culinary excellence from three different venues: Café Vestibül, Palais Bistro, and Karl May Bar. There are six elegant conference rooms on the Bel Etage and a divisible meeting and ballroom for up to 500 people. 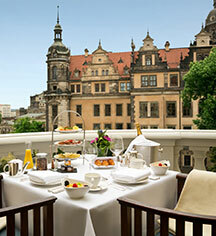 In addition, the Taschenbergpalais has also its own Spa Lounge, and offers catering services in and around Dresden. Hotel Taschenbergpalais is located directly in Dresden's historic city center Innere Altstadt, only a few steps away from the most renowned sights, such as Semper Opera House, Royal Palace, Zwinger and the Church of Our Lady (Frauenkirche). Famous past guests of the Taschenbergpalais include Prince Albert II of Monaco, designer Karl Lagerfeld, and President Jacques Chirac of France. Hotel Taschenbergpalais Kempinski Dresden, a member of Historic Hotels Worldwide since 2017, dates back to the 18th century. President Barack Obama stayed at the hotel on June 4, 2009 during his visit to Dresden and the site of the Buchenwald concentration camp. Hotel/Resort Fees & Taxes: A city tax is imposed by the city of Dresden. Business travelers with proof of business-related travel are exempt from this tax. For more details, please contact the property using the information on the reservation confirmation received after booking. Parking: Self-parking: Available; surcharge. Valet parking: Available; surcharge. Pet Policy: Service animals allowed: Yes. Pets allowed: Yes. Fee: 30 EUR per night, per pet. Amenities: Bed, Bowls, Treats, Food. 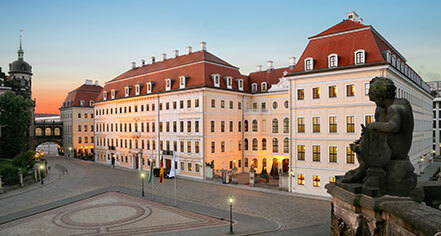 Learn more about the History of Hotel Taschenbergpalais Kempinski Dresden .